Supermoon Rises Into View Monday, Closest Since 1948: Tips On Seeing And Photographing It : The Two-Way It's the nearest supermoon in almost 70 years — and we won't see another like it until 2034. You have three chances to see the moon at its biggest, on Sunday and Monday. 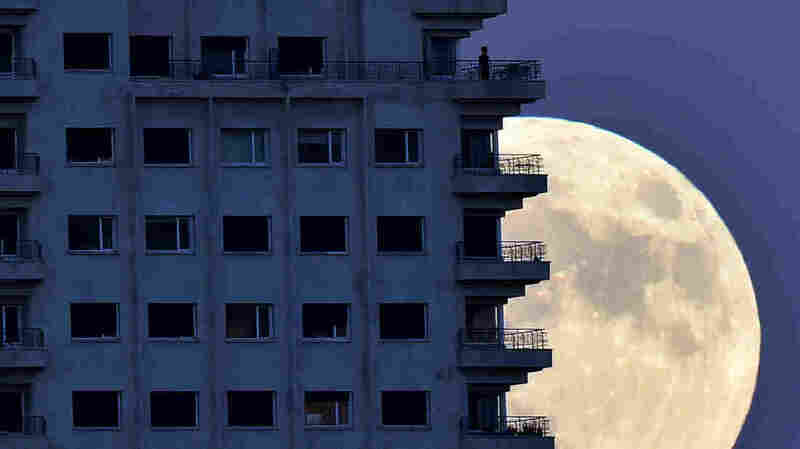 With the Nov. 13 supermoon rising in the background, a man looks out from a balcony in Madrid. At its closest pass to Earth, the full moon can look up to 14 percent bigger and 30 percent brighter, NASA says. In the U.S., we'll get three chances to see the moon at its brightest and biggest, from around sunset Sunday to Monday's predawn and sunset. On both days, the moon will rise around sunset. "The difference in distance from one night to the next will be very subtle, so if it's cloudy on Sunday, go out on Monday," says Noah Petro, deputy project scientist for NASA's Lunar Reconnaissance Orbiter mission. "Any time after sunset should be fine. Since the moon is full, it'll rise at nearly the same time as sunset, so I'd suggest that you head outside after sunset, or once it's dark and the moon is a bit higher in the sky." The moon will reach its orbital perigee shortly before sunrise Monday, at 6:22 a.m. EST; it'll officially become full at 8:52 a.m. EST. "It's a recent term to enter pop culture," Jackie Faherty says of the supermoon label. She's an astronomer at the American Museum of Natural History. "It's actually not a science term; it's a term that was coined by an astrologist over 30 years ago, and it didn't have much science behind it, except that he coined a term for when the moon was full, when it was 90 percent of the closest distance it could be to Earth. And a couple of years ago, it just caught on... I think it's just because someone took the word 'super' and put it in front of the word 'moon.' "
That astrologer was Richard Noelle, who created the supermoon label in 1979. First of all, don't frame the moon alone in the sky, Bill Ingalls, NASA's senior photographer, says: "Don't make the mistake of photographing the moon by itself with no reference to anything." Instead, scout a location that can let you add context to the scene, Ingalls says. And if you're stuck using a smartphone, Ingalls says, "You're not going to get a giant moon in your shot, but you can do something more panoramic, including some foreground that's interesting. Think about being in an urban area where it's a little bit brighter." Those using more advanced equipment can stick with the daylight white balance setting — after all, the light is coming from the sun. Many people will be posting images of this supermoon online — try the #supermoon hashtag on Instagram and/or Twitter. The moon's elliptical and roughly 28-day orbit means that its distance from Earth when it's completely full varies. While the full moon always looks large along a horizon, the effect should be even greater for the next two days. "There's this optical illusion, which, as it's rising or when it's setting, it looks really big," Faherty says. She says to look at the moon "close to the horizon, where you get this optical illusion where your brain doesn't quite know how to interpret the size of the moon with the buildings and the horizon." One thing the supermoon isn't: rare. We're finishing 2016 with a sequence of three supermoons, on Oct. 16, Nov. 14 and Dec. 14. But the one in the middle is unusually close and completely full. "I'm hoping that this will get people to go outside and look at the moon a bit more," Faherty says, "because it's fun to go out and know, as you're standing there and looking up, that it's closer to you than it's been in quite a long time." The last time a supermoon was this close, the year was 1948 — the same year President Harry Truman pulled off a surprising election upset of Gov. Thomas Dewey. That was one year after Hillary Clinton was born, and two after Donald Trump's birth. Back then, a gallon of gas cost 16 cents. The full moon in November also has other names. Space.com reports, "Algonquin Native American tribes as well as American colonists called the November full moon the Beaver Moon because 'this was the time to set beaver traps before the swamps froze,'" citing the Old Farmer's Almanac. The next Beaver Supermoon that's this close and full will be on Nov. 25, 2034.